The Adventures of Tintin Review. The Adventures of Tintin Remastered is a great little collection suitable for young and old. At 840 minutes, this should keep viewers entertained for quite a while, and Tintin fans suitably satisfied. There has recently been a flourish of Tintin related merchandise recently released, to take advantage of the excitement of the release of the new Tintin film. 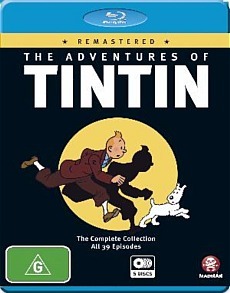 The Adventures of Tintin Remastered is a collection of the 1991 animation series and takes in almost all of the Tintin books (obviously excluding certain ones, including the propagandist Tintin in the Land of the Soviets). One great thing about these episodes are that they follow the stories of the comic books in great detail, including loads of comic moments, that Tintin readers adore, and not omitted due to their irrelevance to the plot, although obviously, not everything that happens in the books can be included. This faithfulness means that the series is full of mystery, laughs and light action. The Tintin books have always had an involving, intriguing story and the series does the books justice. The animations are also faithful to Hergé’s vision, the rendering of the characters and backdrops are taken straight from the books. This particular release has remastered the 1992 adventures into HD. Compared to the previous release of Tintin, the frames have been beautifully cleared, but in certain episodes, some scenes are interspersed with particularly unclear frames, full of artifacts, jagged lines and shadings. Thankfully, these are rare, but they are unsettling and jarring, as the rest of scenes are clear. There are no features in this release but as mentioned before, they do include almost all the Tintin books. The Adventures of Tintin Remastered is a great little collection suitable for young and old. At 840 minutes, this should keep viewers entertained for quite a while, and Tintin fans suitably satisfied.